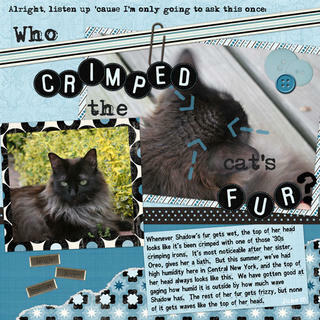 I actually made a new scrapbook page! I was browsing the web this afternoon, and found a contest over at Creaking Keepsakes that sounded interesting. So I downloaded the digi-kit and made this page for the contest. 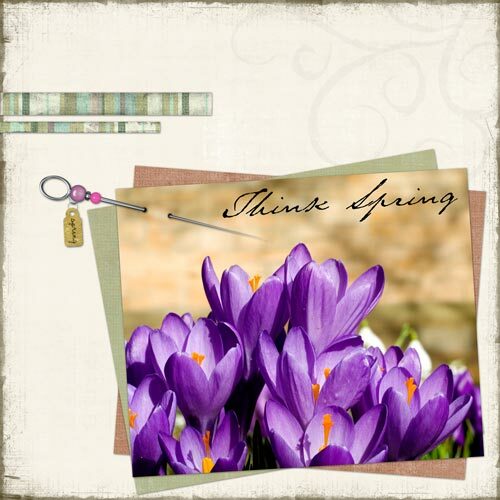 It’s been so long since I’ve been inspired to do any digital scrapbooking, but I had a thousand ideas pop into my head once I saw the swirly piece that was part of the kit. It took me forever to finish this page (I’m a little out of practice), but I am very happy with the results. Maybe with a little luck, I’ll win something in the contest. 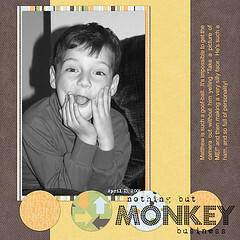 Posted in Scrapbook | Comments Off on I actually made a new scrapbook page! Well, I was waiting to post again until I had some more information about my job search, but hasn’t really happened yet. Here’s where is stands at the moment. I have a job offer from company #3, and supposedly another one coming from company #2. I had told them that I had an offer I needed to respond to, and that if they were going to make me an offer I needed it by yesterday. They called at 4:57pm last night to tell me that they were still working on it, and could I hold on until today. So I should receive the second offer today. If I don’t, then they lost their opportunity, as I’ll be taking the offer from company #3. It’s the job I wanted more anyway. So by Thursday I’ll know where I’m going to work, and fill you all in on the particulars of the job. The weather here has been pretty rainy since Saturday. I wish the sun would come back out, because my job for the week is to spread the 8 yds of mulch that was delivered yesterday. It’s not much fun to do in the rain. Ok, I’ll admit that it’s not much fun to do at all, but much worse when the dirt and mulch stick to you. I was completely filthy after working for 3 hrs yesterday, and I’m pretty sure I brought more of it inside than I left in my garden. It’s going to take me forever to finish this project, cause I’m putting in edging and landscape fabric as I go. But it will look much better when I’m done. Just finished a batch of Chocolate Sorbet in the ice cream freezer. Yummy! Chris was in the mood to make ice cream last night, but we didn’t have the necessary ingredients on hand, so he settled for Sorbet. But he didn’t start it until 9 so there was no time to freeze it last night. So that meant Chocolate for breakfast for me, and I’m not complaining! For Christmas he got the Ultimate Ice Cream Book (which I recommend if you have an ice cream freezer), but we’ve only made sorbets out of it so far. That’s better for me since dairy doesn’t agree with me. I love ice cream and will eat it if it’s around, but I always regret it later. I’ve got no self control. In other news, Chris decided that he wanted to improve his photography, so he’s taking an online class thru the local community college. Don’t know if it will help him or not since he doesn’t have to submit pictures and have them critiqued or anything. But we’ll see. If it works, then I’ll have better pictures to scrapbook, since he’s the primary photographer in the family. And last but not least, I leave you with the latest layout I’ve done. I just loved this photo of my nephew hamming it up for the camera. Wish I hadn’t used the flash though (this is the reason Chris is the photo-taker of the family). Ok off to mulch while its not actively raining. Have a good day! Wow, the phone has been ringing off the hook here today. Mostly it was the recruiter for one of the jobs I’ve interviewed for. I’ve been busy all day, but feel like I haven’t gotten anything accomplished. Did get the kitchen cleaned up and all the dishes done, which I guess is something. Still feeling pretty tired from working in the yard all weekend. Will probably go to bed early since I need to be up and functioning early tomorrow morning for an interview. Got more work to do tonight in prep for it. Yuck. I hope this whole process is over soon. 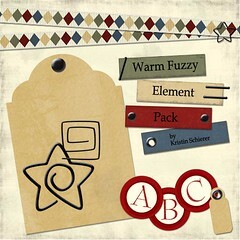 I did manage to get the elements that go along with my paper pack zipped up and uploaded today. Hope you enjoy them. If you use them, leave me a comment with a link to your layout, I’d love to see them! I’ve had these papers sitting around on my computer for a while now. Always meant to share them but I haven’t gotten around to it, until now. I originally made them for a morning show prize at Scrapbook-Bytes about a year ago. I hope you enjoy them. it’s titled Warm & Fuzzy becuase I was inspired by the colors of a blanket I had recieved as a gift. I have some coordinted elements and a alpha that I’ll post a little later on. I read an interesting post yesterday over at Design Observer. The post has been around since March of last year, and apparently been discussed quite thoroughly at many scrapbooking sites, but I apparently missed it at the time. The article is an artists take on the phenomenon that is scrapbooking. I found it very interesting, and agreed with many of the points the author made. Most scrapbookers took the article as a personal insult. I’m sure it was generalizations like this that got them ticked off. It’s at once horrifying and fascinating to witness the degree to which design is being discussed online by people whose concept of innovation is measured by novel ways to tie bows; whose appreciation of photography is ordained by goofy framing techniques; and whose understanding of typography is rather heavily weighted toward pastel drop shadows and generously kerned lowercase script. And I can understand why…I believe the author did not do enough research into good scrapbook design. This was pointed out to her in the comments, and she did agree that there was indeed some good scrapbook design out there. The whole article got me thinking about how I interpret scrapbooking. Is it art? Is it graphic design? I think it depends entirely on what your definition of those words are. I believe that scrapbooking is more of a craft/hobby than a true art form, and that for most people it is not graphic design. I also believe that it is influenced heavily from both art and graphic design. There are many pages that I have seen out there with horrible design…way too cluttered with no thought as to the flow of the page. IMO, this is the majority of scrapbook pages that I see (including many of my own pages). We as a community are not trained graphic designers or artists. I don’t claim to be either, and I will claim not to have a creative bone in my body. Does this mean that we can’t learn and improve? Of course not. I have noticed a great improvement in my design technique since I started a year and a half ago. I can still do better, and I strive to learn a little something with each page that I complete. Do all scrapbookers feel this way? No, probably not. Are there scrapbookers who are artists and graphic designers? yes. Anna Aspens and Rhonna Farrer come to mind. So the other question is, why do we scrapbook? Well, part of why I do it so that I can get some words down on paper to go along with the pictures I have before me and my terrible memory forget the who what when why and where. Part of it is so that I can feel that I’m accomplishing something useful now that I don’t have a go-to-work-in-an-office job. Part of it is so that I have a creative outlet and stretch out the muscles in the other half of my brain occasionally. Does it matter that my pages aren’t perfectly graphically designed? No. Does it bother me that they often lack an artistic element? No. Does it matter that I’m trying my best and learning something? Yes. A big yes on that one. What’s important to me is that someday my kids (hopefully I will have some eventually) will be able to look back at my books and get a better understanding of who their mom and dad were before the kids came around. And hopefully they’ll be able to look back at pictures from their childhood and not have to wonder why there is an appearingly random photograph of an inflatable dolphin in a swimming pool.